Award Winning Kickstop door and frame reinforcing and strengthening products have been Made in Britain since June 1988. London Bar and Birmingham Bar Security Products Ltd can supply any of the 200 plus product variations in the Kickstop range. 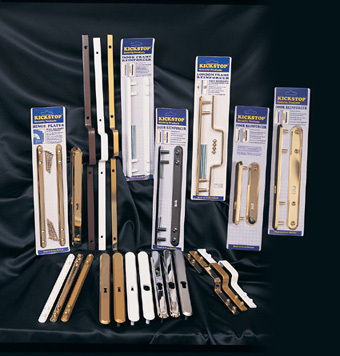 Most Kickstop products are suitable for DIY fitting and are 'easy' to fit. Usually the most difficult process is actually deciding which product is best suited for the door or doors you intend to strengthen and reinforce. If you have a question and this website doesn't provide the answer, please let us know and we'll send you a product guide and further information by post. We can discuss the matter on the telephone if you prefer.